Weston, Washington, began life c. 1885-6. Located at the foot of the western 2.2 percent grade of the Northern Pacific Railway's climb up Stampede Pass to Stampede Tunnel, the town served as the western helper station on the pass, counterpart to Easton, Washington. Facilities included an engine house, telegraph station, water tank, turntable and some ancillary residences and eating houses. 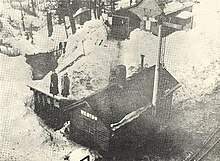 Weston lasted as a small telegraph station (one story, twenty by thirty feet) and water stop on the Northern Pacific until c. 1915, when double tracking of Stampede Pass between Lester and Easton (sans the summit tunnel area itself) completely replaced the Weston Loop and Weston. The image accompanying this article looks down from the large viaduct which crosses the Green River and replaced the old loop arrangement. The exact location of Weston, Washington is still unknown, however it was most likely along the Green River southeast of Lester, Washington and east of Enumclaw, Washington. Old maps show it as being near the confluence of Green River and Intake Creek. Somewhere near 47°12′14″N 121°24′42″W﻿ / ﻿47.20389°N 121.41167°W﻿ / 47.20389; -121.41167. There are many long overgrown man-made clearings in this area and evidence of the original rail line cut through the trees. Carter, Clive and Ann (2009). Washington State Railroad Depots Photo Archive. Iconografix. p. 91. ISBN 978-1-58388-245-0. N.P. Ry. Spelled in Reverse: E.G. Morgan and a Town called Nagrom Article on the history of Nagrom, Washington and other areas around Stampede Pass including Weston. This page was last edited on 2 August 2018, at 22:34 (UTC).